The download version includes a 30 day trial license which is equivalent to Boom Recorder Pro. This will give you time to test the full production flow and decide which of the two licenses: Boom Recorder Pro or Boom Recorder Lite you would like to order. After you have bought a Boom Recorder license from Share-it you can enter the license code and in Boom Recorder's License panel. If you buy Boom Recorder via the Mac App Store, the App Store will install Boom Recorder for you. WAV (Broadcast Wave Format) with iXML metadata and RF64 for files larger than 4 GByte. 16 bit, 24 bit integer and 32 bit floating point sample format. Mono, Stereo and Polyphonic files up to 256 tracks. Metadata such as project, scene, take and timecode is recorded together with the audio. Sound reports in HTML and CSV will be generated after each recording. Modifications to the metadata may be modified after the recording as well. Boom Recorder is able to read a LTC timecode signal from an audio input. When this LTC signal enters the same audio interface as the sound, the timecode will be sample accurate depending on the quality of the LTC signal. 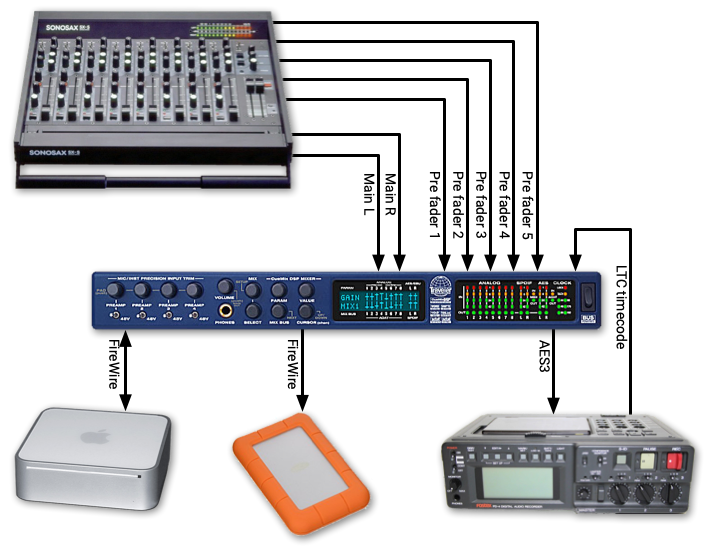 For long recordings it is adviced to discipline the word clock of the audio interface with the same clock that generates the LTC timecode signal. 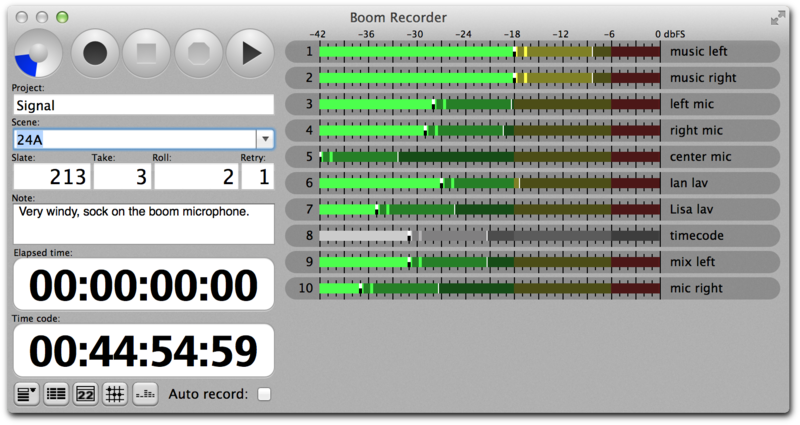 You can configure the actual sample rate of the word clock in Boom Recorder to handle film-to-tv / tv-to-film, pullup / pulldown. Includes fast acting peak-and-hold and VU level meters, both in horizontical and vertical directions, and a spectrum analyzer. A pre record buffer may be used to record a few second before you press the record button, in case you missed a cue. Realtime mixing and routing on inputs and outputs. Long recording can be automatically split based on the length of an audio file. The two most significant features I took a shine to were 1) the metering system; its size and resolution are nearly perfect... highly useful without overkill. The ability to design my own preferred scaling for red, yellow, and green 'zones' is sheer brilliance. A quick glance is all I need for immediate, relevant feedback. I love it! And 2) the adjustable pre-roll buffer. I don't know anyone who hasn't been caught off guard by a momentary diversion that resulted in a near (or even a complete) miss of a cue in the heat of the battle. That buffer is worth the price of admission alone. Apart from those most significant features, I really appreciate the simplicity of the uncluttered interface that boils all of the required field-accessible in formation into a minimalist presentation. Everything you need is there, but JUST the stuff you need. Wonderful! Cletus Baker from Studio B, Ltd. I'm using Boom Recorder again on Season 2 of Project Runway Canada hosted by international fashion icon Iman. Boom Recorder worked flawlessly for me on Season 1, in fact it never once locked up or crashed my MacPro system. Reality television's high track count means I'm often recording 24 tracks of 24 bit audio, 16 hours a day for 30 plus days of shooting, the thing is rock solid. Big ups for the fantastic application. Mark Krupka, Head Audio Recording Engineer, Project Runway Canada. 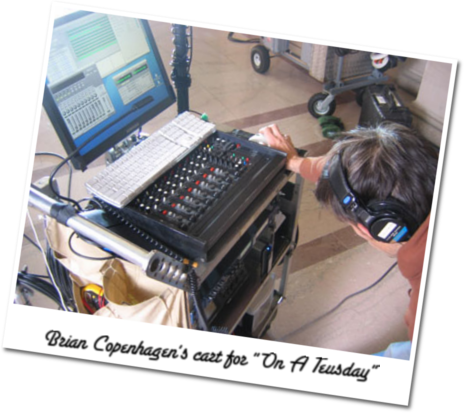 Brian Copenhagen "On A Tuesday"
Brian Copenhagen was the location sound mixer for the 35mm short film On A Tuesday, directed by David Scott Smith. Brian shared his experiences using Boom Recorder as the location recorder. I used Boom Recorder as the primary recorder. With a Sonosax SX-S10 at the front end, audio was sent to a MOTU Traveler for A/D conversion. A full mix was sent via the Main L and Main R outputs to channels 1 and 2, with pre-fader iso outputs per channel sent to the remaining channels on the Traveler. The Traveler was connected to a Mac Mini via firewire. As a backup recorder, I ran a Fostex PD-4 DAT, which served as the LTC timecode source for Boom Recorder. For the backup, the Traveler sent the two mix channels (one was a safety track @ -6 dB) to the DAT via AES digital format. Boom Recorder handled wonderfully. Recording was a breeze with a keyboard shortcut for record and stop, and the 10-second pre-record made sure nothing vital was lost at the beginning of the take. The metadata entry was simple and straightforward. The flexible metering system was accurate and fast, allowing me to set my own nominal levels (a -8 dBFS "yellow zone", and a -2 dBFS "red zone"). Routing audio to various track assignments was another simple task via the logically designed patch bay in Boom Recorder. I recorded BWF 24-bit files in Boom Recorder. Because of Final Cut Pro's previous inability to read timecode from Broadcast Wave files (Apple finally fixed this in FCP 5.1.2), the files were treated with BWF2XML, which allowed the files to seamlessly drop right into FCP with timecode.